Nosilla seems to be asserting her corporeality with Allison more than anything. Don’t you dare deny our love. Don’t you dare deny my existence and my suffering. To be serious, you have the right of it. Nosilla has been ignored for a long time, and she will not be ignored now. What exactly are the red spots on Nosilla’s body? Scales or sores? It’s interesting that Nosilla is yanking Allison forward by reaching directly into her shirt/body and pulling. Perks of not being fully material, I suppose. Allison’s hair is looking pretty disheveled. Sure, she’s fallen, run around a bit, and had her hair blown about( http://brainchild.suzannegeary.com/comic/chapter-1-page-39/ ), but it’s also working as a nice indicator of her mental state. So everyone else appears as a monster or sorta merged WITH a monster like half and half. and Nosilla looks like Allison. maybe she was…cast out somehow? 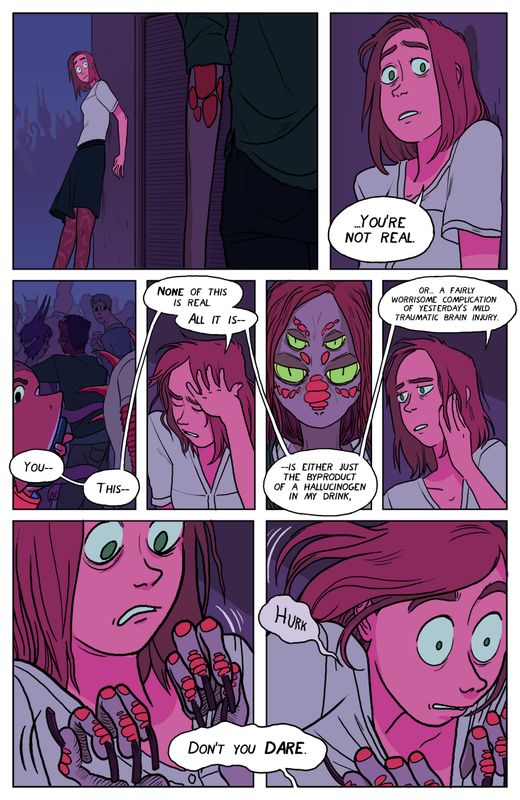 I effingg love this comic, I’m on the edge of my seat after each new page and I always end up re-reading some parts. Thank you so much for sharing,love it! Discovered this comic a while ago and just rediscovered it today. Have to say it’s gone in a different direction than I thought it was going. Can’t wait to learn more about what’s happening. My theory is that this might be how they actually look, but they’ve forgotten or can’t recognise it because of some powerful influence. Or maybe this version of them is their “brainchild”. Whatever that is.